is a small air chamber within the skull bone. The middle ear is connected to the back of the nose, in the upper recess of the throat, by the Eustachian tube . This conduit helps equalize pressure on both sides of the eardrum. The eardrum is made to vibrate by the sound waves reaching it. Those vibrations are transmitted through the chain of ossicles to membranes (or windows) covering the inner ear. The inner ear is a fluid-filled chamber divided into two parts: the organ of balance (labyrinth) and the organ of hearing (cochlea) (g). Vibrations reaching the inner ear set fluid in motion. As the fluid moves, it strokes the specialized hearing cells into electrical impulses transmitted to the brain by the acoustic nerve. The audible range for humans captures sounds between 10 cycles per seconds (Hz) and 24 000 Hz. However, because of its size and structure the ear responds better to certain frequencies than to others. 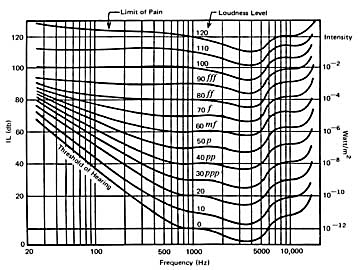 Both the natural resonances and efficiency of the outer and middle ear mechanisms are greatest in the range between 1 000 and 5 000 Hz (*). Beyond this range, the sensitivity of the ear is a little less for higher frequencies and considerably less for lower frequencies. The speed of sound is also influenced by the quality of the environmental air. In very cold air, sound travels more rapidly than when layers of air of different temperatures are encountered. On a very cold night, sounds may be perceived as very clear and sharp. The eardrum and ossicular chain contribute greatly to magnifying the forces transmitted to the inner ear windows. 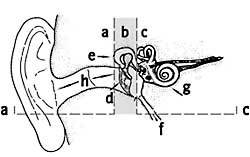 Two small muscles act upon the middle ear ossicles to decrease the transmission of sound to the cochlea. These muscles contract reflexively in response to loud sounds above one hundred decibels. The amount of sound attenuation provided is not large (about ten decibels) but it is helpful in protecting the cochlea from irreversible damage. Since there is a brief latent period before this protective mechanism occurs, the inner ear is still vulnerable to damage from sudden sharp or explosive sounds of high intensity. Dr. Françoise P. Chagnon, is Assistant Professor of Otolaryngology at McGill University and Associate Director of professional services at the McGill University Health Centre.